In general, the software is designed to be intuitive. This menu item controls the whole horizontal angle of the panoramic photo. Normally, RODEONmodular optimizes all turns to always move along the shortest distances to save time. This means that RODEONmodular turns to 360° instead of 0° if the last photo was taken on a horizontal angle greater than 180°. This behavior is deactivated by selecting a maximal angular of 360°. Thus, twisted cables are prevented. 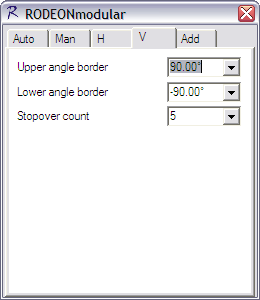 If the upper or lower angle border becomes 90° (Vertex) or -90° (Nadir), only one picture will be triggered in this position. In all other vertical positions, the number of pictures that were selected in the 'Horizontal' menu are captured (Multi-Row). For special camera features or situations, it is useful to take several photos in one position (e.g. for a sequence of different exposures such as HDR). You can select the number of triggers for each position in this menu (Bracketing). Many camera models support this automatic HDR mode. Preshoot time: The time the camera needs to focus (half-pressed trigger). You can use this waiting period after RODEONmodular stops driving to avoid mechanical swinging. Exposure time: The time between trigger and continue moving. Recover Time: The minimal time between two triggers. It is used to avoid triggering until the camera is ready. 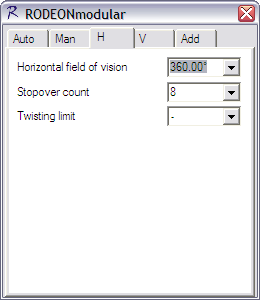 The Speed describes the rotation speed of the drives. We recommend a lower factor especially for heavy cameras. The software writes the actual configuration to a file named "Last used settings" when it completes. This file itself contains detailed descriptions of the script and commands used. Other configurations with other filenames can be saved or loaded in the program window. This way, you are able to store many preferred configurations. Controlling the head by the software is very easy. Simply use the three control buttons after starting up the software. RODEONpreview 2 PRO The advanced software for comfortable and efficient work. Faster and at the same time more secure with online preview. RODEON Scan Controlling and recording software for the RODEONscan panorama laserscanner. RODEONprocessor Easy and automated post-processing Software for Laserscans FOR FREE. How are the RODEON piX Series and RODEON Turntables controlled? Which interfaces are used by the RODEON Panoramic Heads and Turntables? How is the camera released? The Panoramic Head or Turntable releases the camera via a camera trigger cable that is available for all common camera models. 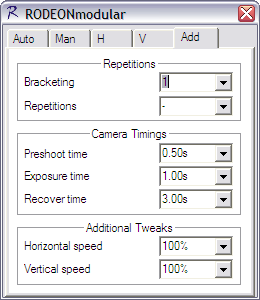 The settings are chosen directly at the camera. Together with RODEONpreview, camera triggering is also possible via LAN. How are the recorded images transferred from the camera to the PC? Is HDR photography also possible? Which languages are supported by RODEON controlling software? 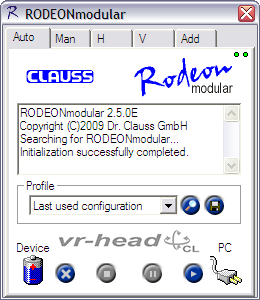 Which operating systems are supported by RODEON controlling software?